Donkeylicious: If We Can't Replace The Dollar With Beef, Can We Print More Money? If We Can't Replace The Dollar With Beef, Can We Print More Money? Back in 2000, I ran a now-long-defunct financial news parody site called DonkeyBusiness. (Whether that has anything to do with the name of this blog is unclear even to me.) It was basically The Onion for the financial news. My first article was "Japan replaces Yen with Beef." There actually was an economic argument for doing this. Japan was stuck in a liquidity trap -- the economy had been sluggish for a while, so the Japanese were securing themselves for an uncertain future by saving their money, so there wasn't enough spending, so the economy just stayed sluggish. My thinking was that if they replaced their currency with a perishable meat like beef, people would have to spend it immediately and the liquidity trap would end. I was looking at this graph from Paul Krugman today, and I was wondering if we need to take similarly extreme measures. 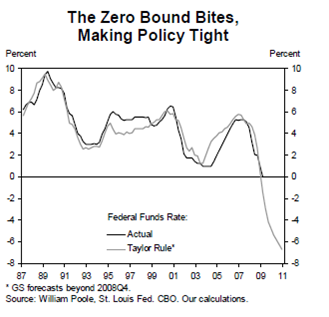 Interest rates can't go anywhere below zero, but the Taylor Rule seems to dictate an interest rate more than 600 basis points below zero. We need super-easy money and there basically isn't any way for conventional monetary policy to generate it. This is why people are talking about enormous fiscal stimulus packages. Not that I actually believe we should do this, but let me ask: what would happen if we printed more money and spent it? This would be wildly inflationary, but if I understand that chart, it's telling you not to worry about inflation. Just throw money into the economy quick! As far as I can see, the big problem is that it sounds so Zimbabwean that the resulting loss of faith in our currency and the government's monetary authority would be disproportionately large, compared to the actual amount of stimulus we would generate by spending the money. Is that the big reason? Or are there others? You Bail Out Them , We Opt Out. If your bank doesn't pay back its credits, how come you should pay it back yours? If your bank gets 0% Loans, how come you don't? At the same time, everyday, some of us are losing our home or even our jobs. Credit discriminates against people of lower economic classes, as such it is unconstitutional, isn't it? It is an supra national stealth weapon of class struggle. Credit is a predatory practice. When the predator finishes up the preys he dies. What did you expect? Where are you exactly in that food chain? Credit is a Stealth Weapon of Mass Destruction. Credit Stands Up Against Both of the Principles of Equal Opportunity and Free Market. Credit is Mathematically Inept, Morally Unacceptable. Opting Out Is Both Free and Completely Anonymous. The Solution: The Credit Free, Free Market Economy. ✔ A Specific Application of Employment, Interest and Money. They Bail Out, Let's Opt Out! Check Out How Many of Us Are Already on Their Way to Opt Out of Credit. Uh, well, I guess some people have ideas even more radical than those in my post. Does Radical Means Wrong? Or Different? Well, in this case I meant different, but I'll go for wrong too. If you abolished interest-bearing credit, nobody would want to make loans. So nobody would get loans. And people need loans for economic activity to go forward. I remember shopping with my grandfather one time and te salesperson asked him if it would be cash or credit. He was offended. He said something to the effect of "I never use credit". I wonder if we wouldn't be better off if more people had that attitude at least when it comes to credit and perishable items. As for changing to currency to a food based alternative I think we should use a more enviromentally friendly currency than beef. You are right that no one would make loans for business purposes. But you will be able to finance with stock emission. What is your other option, anyway? What if the government printed more money to give to banks, but didn't tell anyone about it? I suppose it would eventually leak, but if they could actually get away with it, how bad would it be? I suspect not that bad. What's another point or two of inflation really going to do? As I recall from econ 101, economists generally think politicians are over-concerned with inflation anyway, and that anything under 10% is manageable.